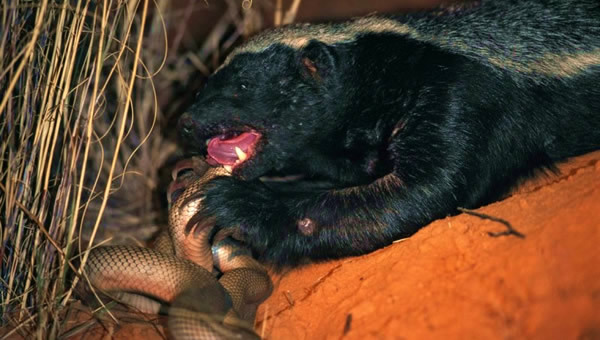 Honey badgers do appear to have some immunity to snake venoms. A honey badger bitten on the face by the highly cytotoxic puff adder showed signs of severe pain but recovered fully within five hours (Begg & Begg pers. obs.). 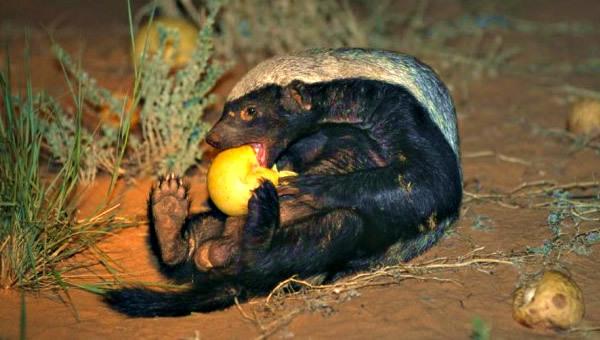 This immunity may develop over the life time of the honey badgers due to regular contact with small amounts of venom in snakes, scorpions and bees. Young cubs are prevented from catching poisonous snakes by their mothers until they have the necessary skills and coordination. Honey badgers are generalist carnivores with an extremely wide diet. More than sixty species of prey were recorded from the southern Kalahari alone. Badgers eat a host of smaller food items like insect larvae, beetles, scorpions, lizards, rodents and birds. They will catch the larger reptiles like leguaans, crocodiles (1 meter) and pythons (3meters) and include the highly venomous adders, cobras and black mamba in their summer menu. Larger mammals like the Springhare, polecat and particularly juvenile foxes, jackals, antelope and wild cats, are also caught. The Honey badger or ratel is a tenacious small carnivore that has a reputation for being, pound for pound, Africa's most fearless animal despite its small size. It is even listed as the "most fearless animal in the world" in the Guinness Book of Records. Check out our resources and information on this wonderous and truly amazing animal.